Material Handling is an Italian company with three decades of experience in material handling and plant logistics in all the industrial sectors such as: food and dairy, pharmaceutical, electromechanical and mechanical assembly and production lines. M.H. production includes: conveyor systems, buffering systems, mergers and dividers, rotating and product handling systems, lifts, trays denesters and many other accessories, which are required in the packaging and production processes of food products. Thanks to their modular design, the units are interchangeable and easy to be integrated into existing lines. A typical requirement of the bakery and confectionery sectors, also common in the packaging of frozen foods, is to receive products from cooling coils or freezing tunnels and feed the machines running the first package with these products, which is typical of flowpack. The products arrive directly from a cooler or freezer, quite often in disarray. In particular, frozen products have to be arranged in a single file on one or more exits, before they are fed to the packaging machine. 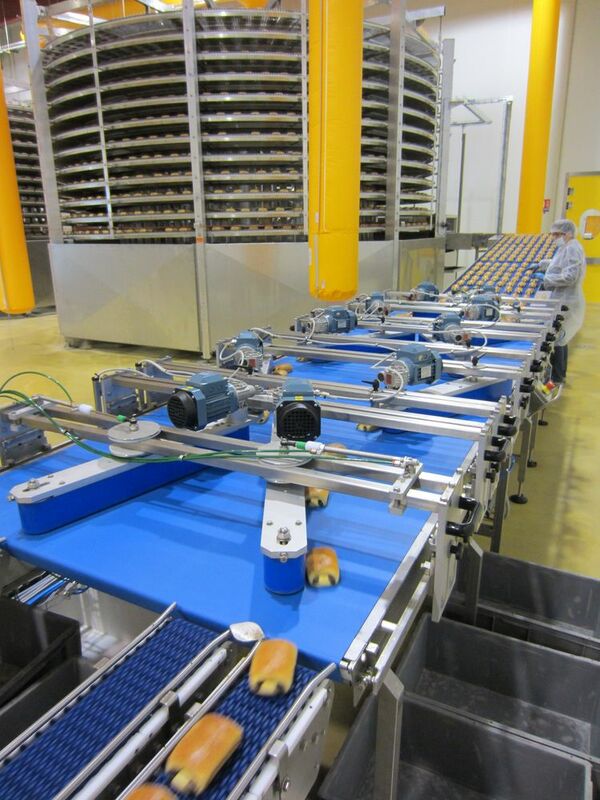 To meet this need, MH design and creates integration and alignment units for non-packaged bakery and frozen products. The standard unification group consists of three conveyor belts or modular chains running at inconstant speed in order to space incoming products. Several coupled pairs of fixed runners positioned above the belts or motorized conveyor belts, with adjustable inclination, slow down some products, while allowing the passage of those that do not come into contact with one another (spreading process). The conveyor can be equipped either with belt or with modular chain, according to the product to be handled. 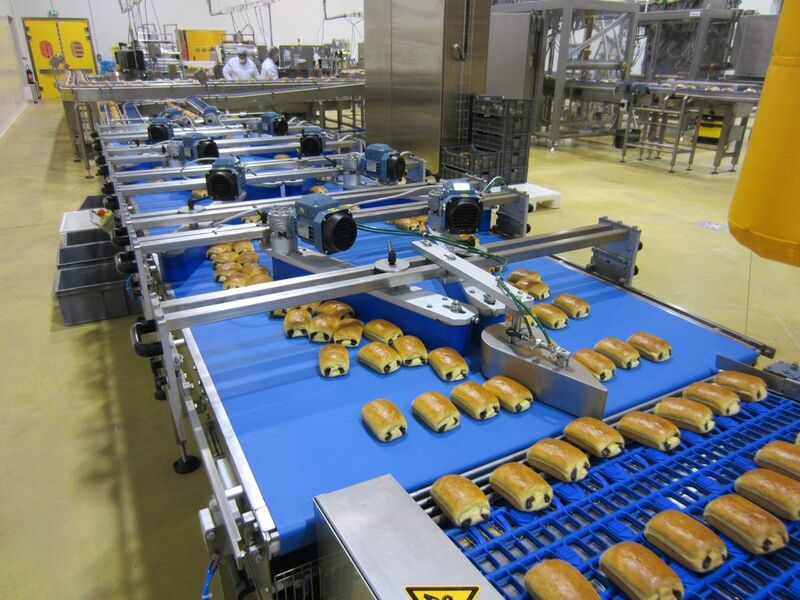 Conveyor belts are typical of the bakery sector. This kind of construction is perfect for handling snacks with filling or chocolate, or for very small products requiring special handling systems. 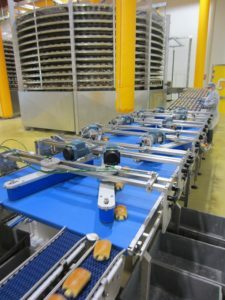 Each conveyor belt is equipped with pneumatic heeling control and roller and counter roller scrapers with related collection tray. Modular chain conveyors, instead, are more suitable for frozen products, which do not pose the risks of material adhesion to the conveyor’s surface. On the other hand, however, they require simple and total sanitization.